trailhead is clearly marked and there is a gravel parking lot along the side of the road. 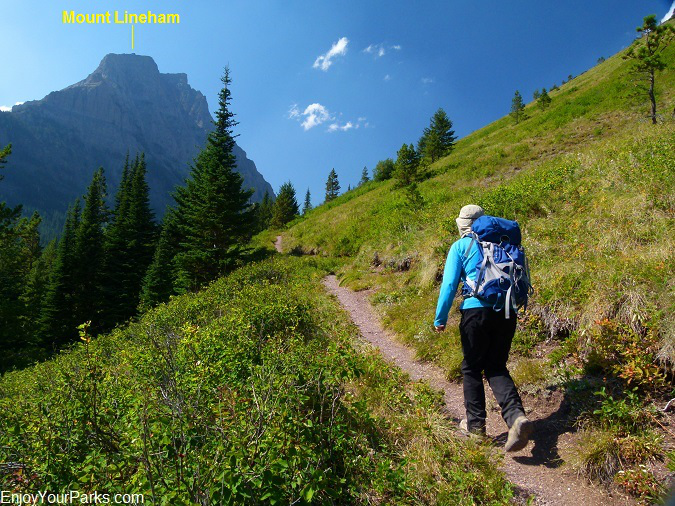 The Lineham Creek Trail is quite scenic the entire way as it follows Lineham Creek up to a sheer headwall where the 410 foot high Lineham Falls looms. To your right towers Mount Lineham, and to your left is Mount Blakiston as you work your way up 1,291 vertical feet in 2.6 miles. Above this headwall and completely out of view are the Lineham Lakes, which feed Lineham Falls. The Lineham Falls Trail initially takes you up an open meadow at a fairly steep grade as the impressive Mount Lineham towers above you to the west, as Lineham Creek is seen far below you. 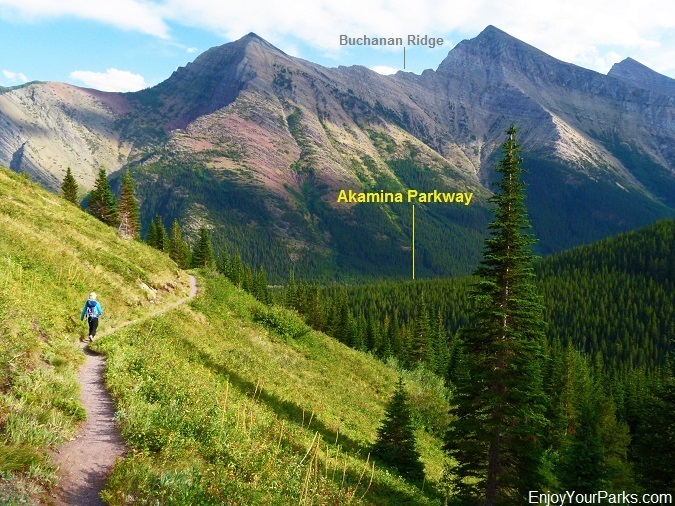 Mount Lineham dominates the skyline as you work your way up an open meadow along the Lineham Falls Trail in Waterton Lakes National Park. In time, the trail will become a little more gradual as you enter a nicely wooded forest next to Lineham Creek. 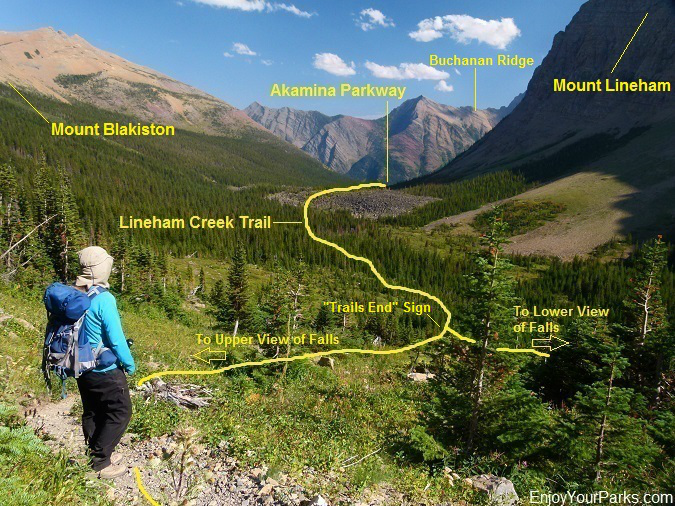 Along this section of the Lineham Creek Trail in Waterton Lakes National Park, you will enjoy several nice cascades and a view small waterfalls as you make your way westward. 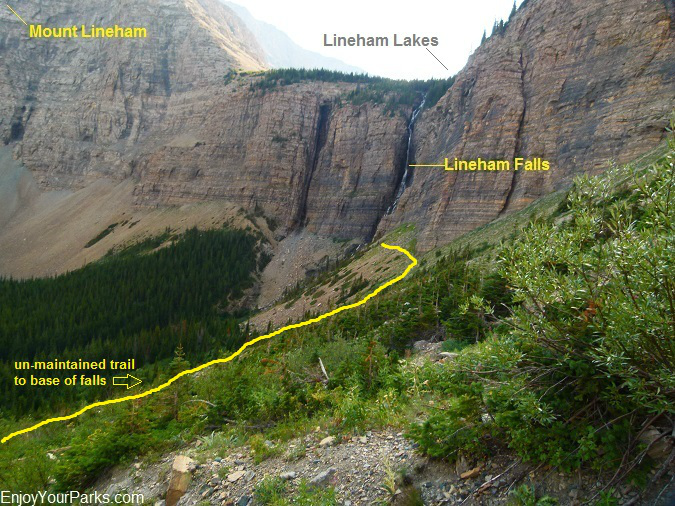 The Lineham Falls Trail will then enter a massive basin as it leaves Lineham Creek, and you will then begin to see the massive headwall to the west, which is where Lineham Falls is located. As you work your way across open avalanche shoots and rock slides, you will eventually reach the terminus in a sub-alpine meadow. The headwall and Lineham Falls is still about a quarter of a mile to the west of this point. Below is a photo of this large basin. Lineham Falls is still far to the west. This is a view of the massive headwall and Lineham Falls just before the trail enters the large avalanche basin to the west. Lineham Falls in Waterton Lakes National Park is incredibly impressive early in the season during the spring and early summer run-off as the snow is melting in the high basin above Lineham Falls where the three Lineham Lakes are located. However, later in the season, as the water levels drop, the falls basically turn into a trickle, and are not that impressive. Unfortunately, the day we hiked this trail with our cameras was indeed late in the season, so we will have to return to photograph Lineham Falls when the water is roaring down this incredible headwall. 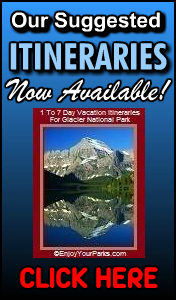 But we must say that the scenery is very nice the entire way up and back, and we'd recommend this hike regardless of the waterfall situation. 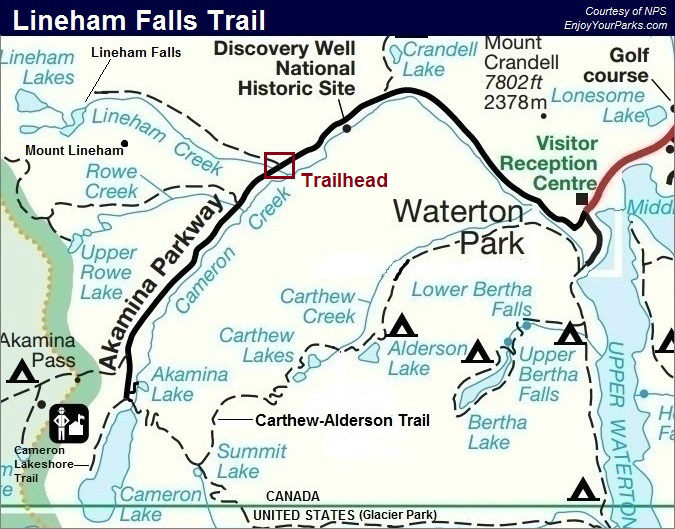 At mile 2.6 along the Lineham Falls Trail, you will reach a dead-end. You'll see a sign that says "Trails End". About a quarter of a mile in front of you towers the mighty headwall and Lineham Falls pouring off of it. You will see traces of an un-maintained trail heading for the base of Lineham Falls. At the main trail's dead-end you will also see a primitive, un-maintained trail that heads uphill to the right. 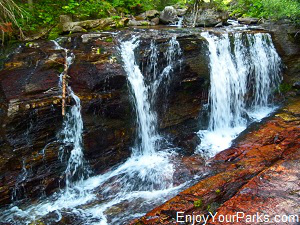 This steep trail takes you to a higher vantage point to view the falls. If you choose not to take this primitive trails, that's just fine too. 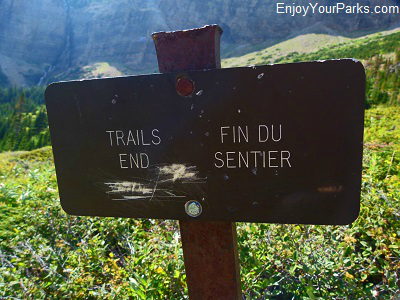 The view from the "Trails End" sign is actually quite adequate, and you've accomplished your goal. 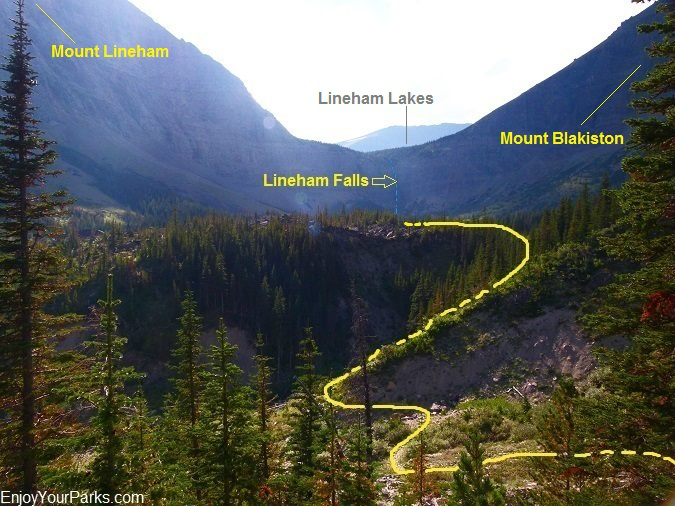 Again, Lineham Falls is much more dramatic early in the season due to heavy snow melt, so keep this in mind when choosing your Waterton Lakes National Park hikes during your vacation. Here's a view looking back down the canyon from the upper primitive trail. The junction in the trail is where the "Trails End" sign is located. This is a view of Lineham Falls from the "upper" primitive trail. The "lower" primitive trail is the trail marked as yellow in this photo, which takes you nearly to the base of the falls. As you can see, this photo was taken late in the season when not a lot of water was coming down these falls. 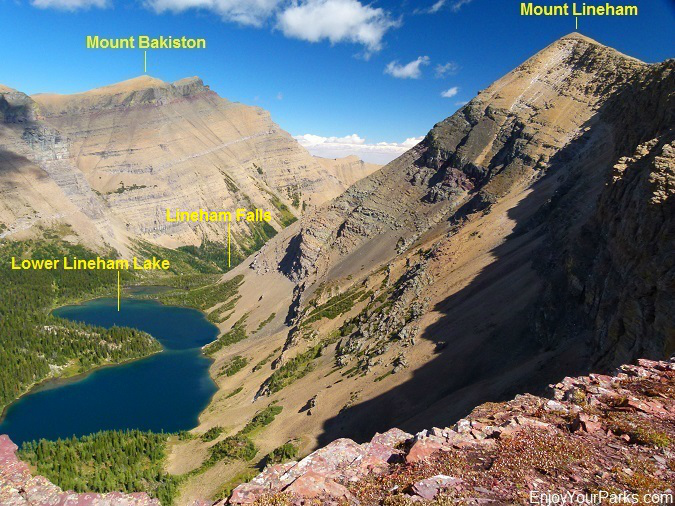 Above the massive headwall are the three Lineham Lakes that feed Lineham Falls in Waterton Lakes National Park. These lakes are far above you and are of course out of view. There is an old un-maintained route that takes you up and over this sheer headwall to the Lineham Lakes that we will not disclose to our readers for safety reasons. The exposure at times is quite nerve-racking and the rock is very unstable, therefore we do not recommend taking this route to visit Lineham Lakes unless you are a skilled mountaineer. Even if you are highly skilled, it really isn't worth the risk getting up there in our opinion. 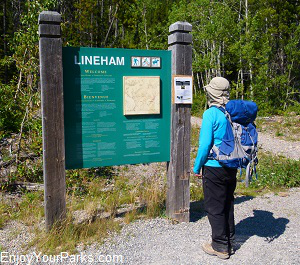 There's an easier way to get to Lineham Lakes along the Tamarack Trail. Below is a photo of Lineham Lakes from the Tamarack Trail along the west buttress of Mount Lineham. This is a view of Lower Lineham Lake from the west buttress of Mount Lineham along the Tamarack Trail in Waterton Lakes National Park. Once you've spent time enjoying Lineham Falls along the Lineham Creek Trail, you will enjoy some excellent views of the Cameron Valley where your vehicle is parked, as well as the amazing peaks of Buchanan Ridge dominating the skyline to the south. The view on your way back down to your vehicle is really spectacular. You'll get a great view of the amazing Buchanan Ridge, as well as the broad Cameron Valley where the Akamina Parkway and your car awaits you. All in all, the Lineham Falls Trail is quite pleasant, even if it's late in the season and the falls are a mere trickle. If you fortunate enough to visit Waterton Lakes National Park early in the summer, then you will definitely get to see Lineham Falls in all of its glory. 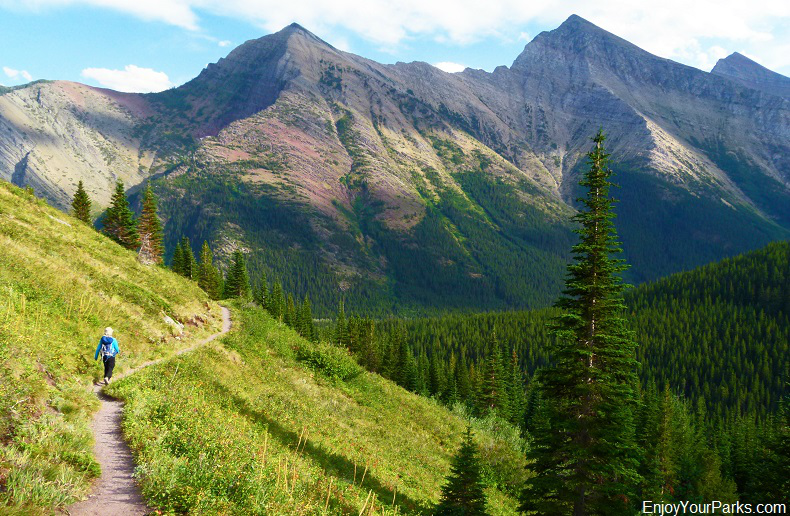 If not, you'll still enjoy this pleasant hike.